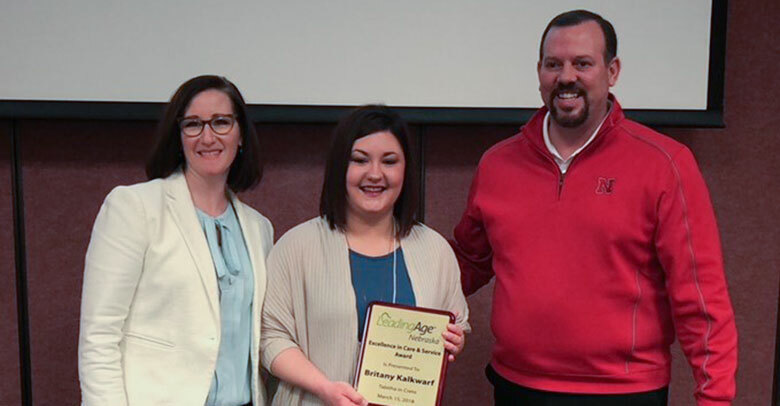 Tabitha in Crete Resident Assistant Britany Kalkwarf was honored with Leading Age Nebraska’s 2017 Excellence in Care and Service Award at LeadingAge Nebraska’s annual Spring Conference in Kearney. This award is given to someone who embodies remarkable commitment to seniors. Kalkwarf has been a nurse aide at Tabitha in Crete—Skilled Nursing and Long-Term Care for the past six years. For Seniors and their families seeking compassionate, expert assisted living, skilled nursing and long-term care in Saline County, Tabitha is the answer. Tabitha in Crete—The Gardens Assisted Living and Tabitha Residences—Skilled Nursing and Long-Term Care residential communities offer the best care available in a convenient, warm and loving rural atmosphere with all the comforts of home. Each community is backed by the Tabitha Senior Care Continuum and expert professionals who help clients determine which care options are right for their situation. As a nonprofit organization, Tabitha is in service to a mission where upmost quality of care and client dignity is at the center of all they do. For more information about Tabitha in Crete, contact Continuum Navigation at 402.486.8520.